Ms. Sumita Misra, Chairperson of Chandigarh Literary Society released Vandana Shah’s book, “The Ex-Files” published by Shobhaa De books and Penguin Books India on 21st March at the Chandigarh Golf Club. Told through her own personal story, The Ex Files reveals the hardships of divorce and also the joys of emerging stronger with your positive thinking and humour intact. The book also deals with the legal and social aspects of divorce, so often overlooked in India, and provides an indispensible guide to the ins and outs of proceedings. Noted author, columnist and tv personality, Khushwant Singh moderated the session. In 2001 Vandana Shah, despite her best efforts to save her marriage, found herself facing a divorce petition. But instead of wallowing in self-pity, she picked up the pieces of her shattered life and moved straight on. She not only found a job but went on to become a divorce lawyer and a community leader, starting India’s first divorce support group and network. At once funny, tragic and uncompromisingly honest, this memoir will resonate with anyone who has endured the end of a marriage and come out changed. Vandana Shah studied at St Xavier’s College in Mumbai and has since donned various hats including that of a model, a deejay and an advertising professional. After being thrown out of her marital home with just the clothes on her back and Rs 750 in the bank, Vandana rebuilt her world and founded the first Indian support group to help people going through a divorce, 360 Degrees Back to Life. She has since come full circle from being a litigant to being a divorce lawyer and practices at the family court in Mumbai. Vandana writes a monthly column in the magazine, Black and White Oman and she edits Ex-Files, India’s first divorce news magazine. She has also participated in the Lead India Programme and was the winner from Mumbai in 2010. Vandana’s work for the cause of women going through divorce in India has resulted in a BBC documentary about her work, entitled Invisible Women of India. This was broadcast worldwide on international Women’s Day in 2014. Her first book endorsed by the iconic feminist Gloria Steinem won an award and she has translated another book on the Jain faith from English to Hindi. She also received the NAI Achievement award for the best lawyer in India for Women’s Rights in November 2014. Preeti Shenoy: “The only woman in the best-selling league”. 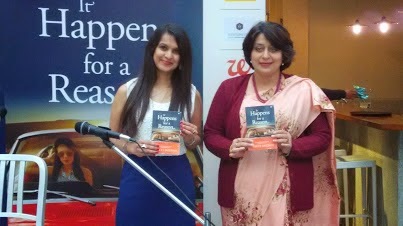 Ms. Sumita Misra, Chairperson of Chandigarh Literary Society, released “It Happens for a Reason” by India’s best-selling author Preeti Shenoy at the Whistling Duck restaurant here today. Best known for her romantic novels including ‘Life is What You Make It, ’34 Bubblegums and Candies’, and ‘Tea for Two and a Piece of Cake’ ‘The Secret Wishlist’, Preeti shared her journey as an author from being a blogger to a columnist for various publications. Now author of five best-sellers, an artist who love to paint portraits, or indulge in paper quilling, a oet, yoga-buff, ex-basketball player, Nature lover, Ted X speaker is what describes her multifarious and diverse interests including working with under-privileged children. “It happens for a Reason” is an engaging and enthralling love story which puts the protagonist, who is just 18, single and beautiful into a situation where she gives up her promising career in modeling to have her baby, and how her life takes new turns after sixteen years, Preeti remarked. Amidst twists and turns of our lives we come across numerous instances when something unexpected happens, and what Preeti philosophically puts it that it happens for a reason. When asked as to how she manages her time with the family and professional duties and yet get to write so many books, Preeti said that she got herself into the habit of writing daily, come what may; a promise she keeps. She is known for her descriptive details and keen observation while writing which, Preeti admitted, is result of her extensive research on subjects and situations by personally engaging herself whether it is a mental hospital or life in the street. The book has been published by Westland, and Ms Sarita had coordinated her visit to the city. Members lapped up her five books from the stall set up by the Bookstore Partner, Capital Book Depot. And our special thanks to Mr Ambar, the owner of Whistling Duck Kitchen and Restaurant for an excellent and elegant snacks over a warm cup of tea at the end of the session. Noted literateur, Ashok Vajpeyi released the book of Hindustani poetry, ‘Zara See Dhoop’ penned by Sumita Misra, the chairperson of Chandigarh Literary Society, here today at the UT Guest House. Her mother Dr P.K. Misra, to whom her book is dedicated along with sufi writer and bureaucrat Vijay Vardhan and Hindi writer Madhav Kaushik joined. 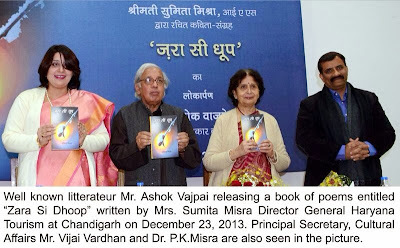 Commending on Sumita’s poetic style, noted writer and poet Ashok Vajpeyi remarked that one could see a new spark and a new thought process in her poetry which has a touch of Urdu in her Hindustani typical of Lucknow nuances. Ashok Vajpeyi kept the audience amused with his wit and humour and remarked that bureaucrats writing poetry has one clear advantage that they go through tremendous challenges and get to see the despair and tribulations of common man which might provide them with inspiration to indulge in creative pursuits but may also at least help them bring some humane touch to the process of governance. The Advisor to the Administrator Mr K.K. Sharma, Finance Secretary Mr V.K. Singh along with city’s gliterati attended the function. Vijay Vardhan in his baritone voice recited some of Sumita Misra’s poetry including ‘Mujhe Chahiye’, “Achha Hai’, ‘Mera Hissa’, ‘Chalo’ etc, which according to him, depicted varied shades of life and in a way depicted tinge of despondency, but had portrayed moments of joy too. Her mother, Dr. P.K. Misra, recalling her journey from childhood recalled her late father’s word who always inspired her with the words, “sky is the limit for you”, which she has proved time and again. Sumita Misra is an acclaimed poet and has earlier published two books, one of poems in English titled ‘A Life of Light’ which has a foreword by Sh. Khushwant Singh, and another book of poems in Hindi titled ‘Kadmon ki Laya’. Sumita Misra who is currently posted as Secretary & Director General for Haryana Tourism & Hospitality and is the Managing Director of Haryana Tourism Corporation, but has deep interest in literature, and has been instrumental in organizing highly successful Chandigarh Lit Fest – Literati – in November 2013. Born and brought up in Lucknow, she had an illustrious academic career having topped both Born in Lucknow to doctor parents, Sumita Misra did her postgraduation in Economics from Lucknow University and had been a gold medalist and topper both in her BA and MA, as well as in Indian Administrative Service which she joined in 1990, as a topper and 10th position holder in her batch amongst women. She has served the Haryana government on various positions for last 23 years as managing director/executive administrator/special secretary in the areas of education, rural industries, renewable energy, power, irrigation, women and child development. She also did short-term courses in public policy from Harvard University, USA & Royal Institute of Public Administration, London, IIM Ahmedabad & IIM Bangalore. She is receipient of Haryana State Gold Medal for outstanding work for Red Cross and Child Welfare activities. She had been instrumental in getting Haryana three National Awards from the President of India Smt. Pratibha Devi Singh Patil for outstanding work in Renewable Energy in 2007. Under her leadership Haryana was the National Award winner among all States for Energy Conservation for three years in a row, which is a record.